I recently read a magazine interview with Natalie Imbruglia talking about how when she rose to fame she was “highly successful and famous but desperately unhappy”. This got me thinking – what is our definition of success? The implication in the interview was that money and fame is success – but if she was “desperately unhappy” how could you call yourself successful? One of my passions in life is to help people to have successful lives. But what does that mean? How do we evaluate success? It depends on so many factors. We all come from different starting points and all have a different path to lead in life. I think a lot of people in the western nations would call themselves successful if they have plenty of money, a “good” job, a good house and a loving family. But what is a good job? One that pays well? One that is reliable/secure? How much money do you personally need to feel successful? Is success a state of mind? One persons success ie a “good” job could feel like another’s prison. In western nations, you are considered successful if you are a high academic achiever. Does that ultimately make you happy though? And if you are wealthy. Does money make you happy/successful? What about if your strength isn’t academically? How can you then achieve success in the eyes of society? Do you need to be successful in the eyes of the society you live in? It concerns me that our individual expression is being discouraged. Our education systems seem to encourage lack of individual thinking. Some secondary schools are phasing out the Arts as they aren’t deemed to be decent subjects – in the eyes of whom? The universities looking to get the bright children on their courses so they can then work in pressured stressful office jobs for years, hooked by the golden handcuff promise of a good pension and private health care. We seem to have become a society that expects to feel stressed and busy most of the time. I’m shocked by how many of my clients seem to be resigned to stress being a “normal” part of their daily lives for many years. How can living from an adrenalised place be natural/normal or something we want to promote? If you want to achieve success in your life, maybe you need to start by defining what success looks like for you. Just you. Not for your parents, your friends, your religious upbringing, your society. But just for you. It is easier to get to where you want to go, if you know where you are heading. Maybe success is having a goal/dream and working towards that, embracing the lessons you learn along the way. Maybe success for you is finding an inner contentment. Knowing that even though some days you may be observing your predominant emotion is sadness or anger, that deep within you have a level of contentment and confidence that you are ok. At a soul level, all is well. My passion is encouraging people to live their lives fully, feeling confident and brave enough to follow their divinely inspired dreams and visions. Sometimes we may need to take risks. But do we want to look back and have regrets, or feel like we have wasted our life? or played it too safely? Following our passions and dreams makes us feel alive. 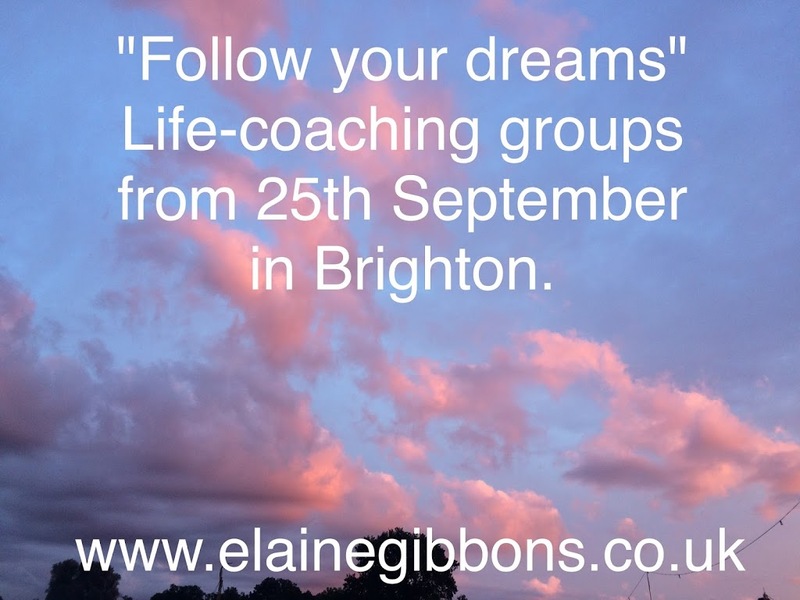 I am running mini life-coaching courses from 25th September in Brighton on Friday mornings and Monday evenings, supporting and encouraging people to follow their dreams and living a full and passionate life. I also offer one-to-one life coaching in person, via telephone or skype. 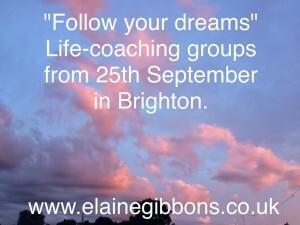 Please go to my website www.elainegibbons.co.uk for more information and to book.